It’s no secret that the upcoming 2016 presidential election has been a hot topic in the news this year. Between the numerous Republicans throwing their hats in the ring to the discussions around whether VP Joe Biden would run and who, exactly, would be participating in the debates, there are a lot of names, faces, and personalities. Some stand out more than others – and some campaigns are tapping into emerging media and digital marketing to help their candidate pull ahead. Bernie Sanders website is full of information about his stance on hot button issues. Each issue has its own dedicated page with well written rhetoric and data (including graphics) to back it up. There are even indicators that some campaigns may be rigging SEO through backlinks. “It may seem a little crazy to think that the marketing committees of U.S. presidential candidates would try to manipulate Web traffic, but an SEO audit of the Republican presidential candidate frontrunners conducted by Walker Sands Digital found that Donald Trump’s Web site has 1.35 million backlinks. The count is 934,000 more than the candidate with the second-highest, Hillary Clinton, with 416,000 backlinks. Social media has made it possible for consumers to voice their opinions on products and brands more readily. One industry in which this is particularly evident is beauty products. Take YouTube, for instance; the social media video site is full of influencers recording videos of themselves trying beauty products and reviewing them. You can see a few examples below. There is no question that social media has become one of the primary ways that many people communicate and share their lives with others. With statistics showing that 37% of people spend 6 or more hours a week on social media and that there are 1.15 billion Facebook users and 1 billion YouTube users, it’s clear that social media is here to stay (at least for now). One industry that has found huge advantages to getting involved on social media is the nonprofit world. Just check out the following infographic if you don’t believe me! There have been concerns, however, that the advent of social media and its ties to the nonprofit industry are somewhat damaging to a nonprofits bottom line. “Slacktivism ‘describes ‘feel-good measures’, in support of an issue or social cause, that have little physical or practical effect, other than to make the person doing it feel satisfied that they have contributed’.” We touched on this briefly during a blog post a few months ago in the wake of the Paris attacks. A study by the University of British Columbia Sauder School of Business found that those who showed support online felt associated with the cause but also lessened their likelihood to commit any tangible resources, such as money, to them. The bottom line is that it is important to think critically about just how far your click can reach. The outcome can vary wildly depending on the situation, and nonprofits often measure their success in dollars and not likes. So, what can be done? Should the US and other countries start an anti-terror social media campaign? Black Friday has been around since the 1950s, and although there are many myths of its origins, the real story was unveiled by the History Channel; “police in the city of Philadelphia used the term to describe the chaos that ensued on the day after Thanksgiving, when hordes of suburban shoppers and tourists flooded into the city in advance of the big Army-Navy football game held on that Saturday every year. Not only would Philly cops not be able to take the day off, but they would have to work extra-long shifts dealing with the additional crowds and traffic. Shoplifters would also take advantage of the bedlam in stores to make off with merchandise, adding to the law enforcement headache.” This true story was eventually overshadowed by marketers trying to spin the day in a more positive light as we know it today: a day of discounts so deep that people line up as much as a day early to score big. Black Friday has spawned a few other “shopping” days including Small Business Saturday, Cyber Monday, and Giving Tuesday. These days are mostly in response to the ram pant consumerism of Black Friday and encourage shoppers to support small, local businesses, shop from the comfort of their home, and support their favorite charities. In addition to these other shopping days, many retailers have put their foot down recently. This year, REI announced that it would be sitting out the Black Friday festivities by closing on Black Friday. And of course, REI was “open” for Cyber Monday and offering sales and deals. Is this a shift to more web-based shopping? What do you think this means for brick-and-mortar stores? Marketing Tragedy: is it okay? This week, tragedy struck the French capital of Paris when a series of coordinated terrorist attacks shocked the city and left over 120 dead and over 350 wounded. Around the world, religious and political reasons condemned the attacks and pledged their su pport of Paris in the wake of the attacks. According to a CNN article, “U.S. President Barack Obama pledged solidarity with France, saying, We’ve seen an outrageous attempt to terrorize innocent civilians.’ Pope Francis condemned the killings, saying they were a part of the ‘piecemeal Third World War.’ ‘There is no religious or human justification for it,’ he said in a telephone interview with TV2000, the television network of the Italian Bishops’ Conference.” And not long after the attacks, people across the globe began to show their solidarity through hashtags and other forms of social media. Some changed their Facebook profile pictures to be shaded with the colors of the French flag. 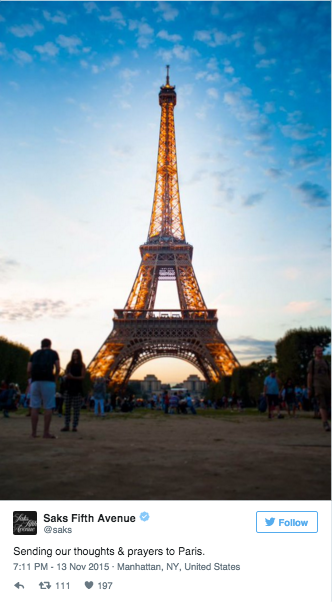 Some posted pictures from trips they had taken to Paris. “Facebook also made available its Safety Check, which allows users and others to mark themselves safe in the wake of a disaster” (source). And then, the brands began to get involved. 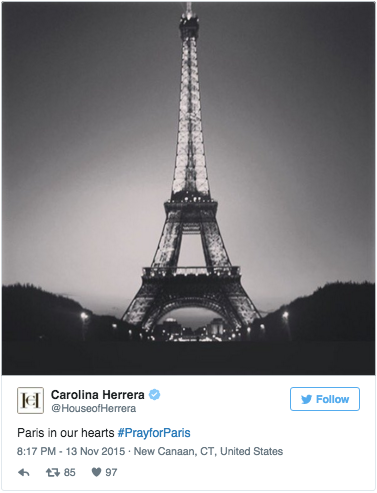 Many French and international fashion brands used social media to show their support, including Ralph Lauren, Carolina Herrera, Saks Fifth Avenue and others. Paris is one of the fashion capitals of the world, so this felt natural. It wasn’t until other brands started to get in on the action that I began to feel a little uneasy. 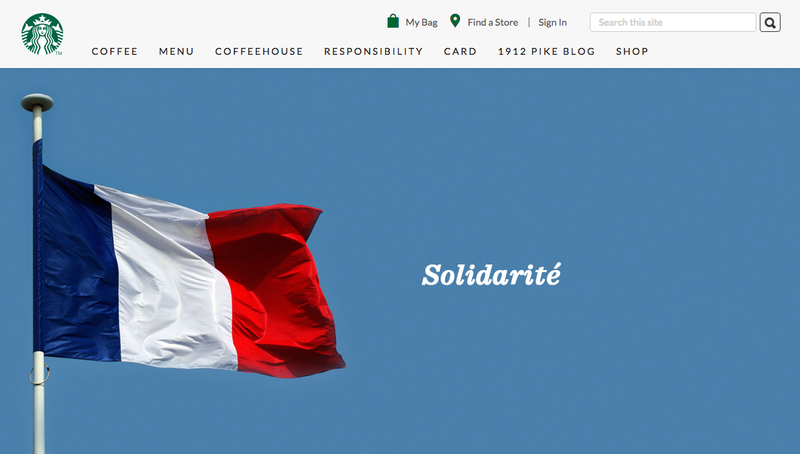 Amazon and Starbucks changed their websites to reflect their support, as you can see below. And I found myself wondering: is it okay to do this? There’s a reason I’m grappling with this. 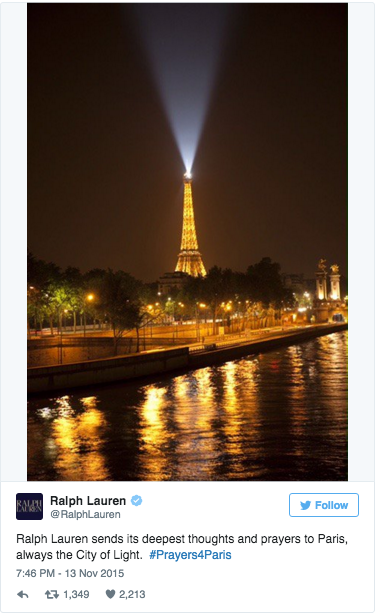 On the recent 9/11 anniversary, many brands posted on social media with hashtags like “Never Forget” and others. “Advertising-industry publication Digiday asked whether brands should even be tweeting about 9/11: ‘One would think that the most respectful thing a brand could do would be to not say anything at all, unless the brand’s employees or customers were in some way directly [affected] by 9/11.’ So, when would it be OK? Digiday specifically referenced a tweet from the American Red Cross, which read simply, ‘Today, we remember #september11.’ That tweet, as you might expect, drew only positive responses. The same can’t be said for one from the Los Angeles Lakers, who Ad Age said ‘seemed to realize they were treading on thin ice’ by tweeting a Kobe Bryant photo with the #neverforget hashtag as a graphical overlay. The Lakers quickly deleted the tweet” (source). So, what do you think? Is it appropriate? Or should brands whose employees have not been directly affected by a tragedy avoid commenting? Lately, however, I’ve noticed that a few of my guilty pleasure online shops have been reaching back out to me after I’ve abandoned my full cart. While recently doing some shopping on Old Navy, I added a few items to my cart, got distracted, and turned my computer off. A few hours later, I received the following email. 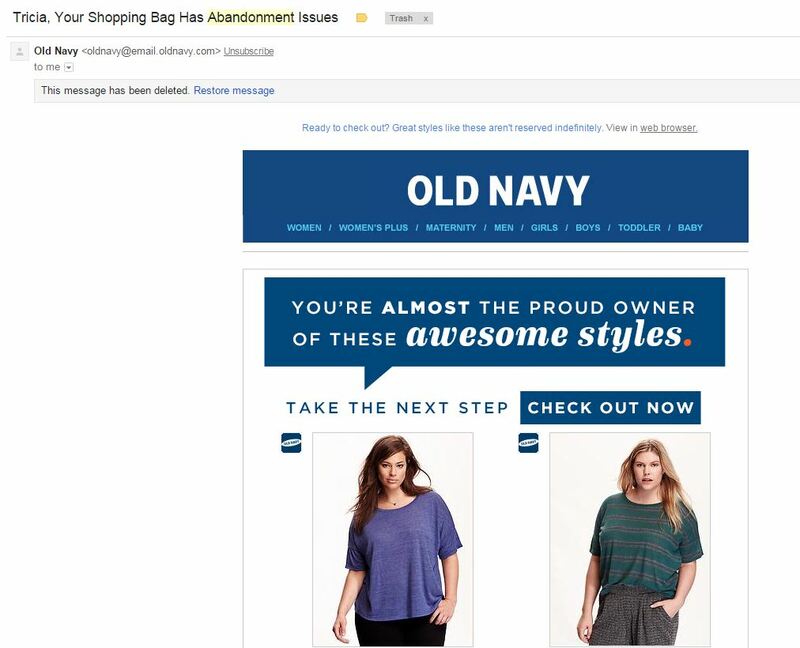 The follow-up email after identifying an abandoned shopping cart has become more prevalent in recent years, in addition to other strategic methods. The following infographic from Monetate spreads some of this same gospel. With these tips in mind, your ecommerce site won’t need any kind of therapy for its abandonment issues!